An extended family tree showing the complicated inter-relationships between several families can be seen on the Family Tree page. It would be useful to make a printed copy for easy reference while reading these pages. Thomas Ball appoints his namesake, 'son of my brother William', as one of three executors. He says he is 'very sick and feeble of body' and is 'very anxious that the appointed executors should look after my dear and loving wife, Agnes' and should 'always show a respect for her for my sake'. In fact he lived 3 more years till 1769. He does not appear to have had any direct descendants. Nothing is known of William, his brother, but this line continues with William's son, Thomas, b.1738. Thomas's nephew Thomas Ball of Bulk (1738-1816), married Elizabeth Brown (1740-1808) on 28 Aug 1758 at St Mary's, Lancaster and they are known to have had eight children though the birth or baptismal dates of some are unknown. 'The return of Papists' of 1767 to the Bishop of Chester lists Thomas Ball aged 29, husbandman and as 'resident for one year' at Dolphin Lee. His wife Elizabeth was given as 27 and his children as Ellen 8, Mary 6, John 4, and Richard 3 months so the others were all born after 1767. Thomas was said to have been living at Dolphinlee for a year, having presumably taken over the farming when his uncle was sick. Robert and Jane Cornthwaite, brother and sister, came from the same family as Bishop Cornthwaite of Leeds. John Ball married Jane Cornthwaite on 17 Jan 1785 and 3 weeks later Mary Ball married Robert Cornthwaite on 7 Feb 1785, both ceremonies being at the Mason St Chapel on Leonardgate, Lancaster (recorded as 'St Peter's') which succeeded Dolphinlee. Perhaps there was another son, Robert, not included in the list above. The possibility is suggested by a later connection with the Kirkham family. to Betty Walker of Wyresdale. " If she dies it shall pass to Jane Walker her daughter." 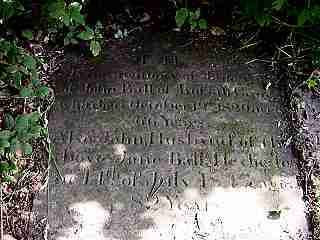 to Thomas Ball, son of John Ball of Rossall. The rest of the estate was to be administered by the executors and divided in the same proportions. Thomas died 6 Apr 1821 at his home on Mackerall St (now Spring Garden St) of "old age and asthma". The Will was proved on 2 May 1821. His wife Ellen died at 31 Spring Garden St, Lancaster at the age of 93. She also wrote a Will, leaving "all my Dwellinghouse with the appurtenances thereto belonging...to my said daughter Ellen " and money to her daughter Mary, wife of Samuel Lee of Sandbach in Cheshire, and her sons Thomas Parker of Lancaster, shoemaker and John Parker of Lancaster, labourer. This farm was one of the farms belonging to the Rossall Hall estate, land originally owned by the Allens of Rossall Grange. Rossall Grange itself disappeared under the sea in the 16th century. What remained of the property was taken by the Heskeths and the Allens were driven into exile in the Spanish Netherlands because they were Catholics. William, Cardinal Allen, founded Douai which trained priests for the English mission throughout penal times. As devout Catholics the Ball family must have been delighted to farm here in the early 19th century. 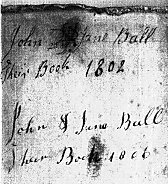 A will listed for a William Ball in 1799 is connected with Rossall and this may be the reason that John and Jane Ball took over the farm. The only survival of the farm is in the name "Rossall Grange Lane" This lane runs from the Queen's Hotel in Fleetwood up to the Golf Clubhouse. The farm was at the end of the lane opposite the Clubhouse. Jane Cornthwaite was born at Claughton in 1763, daughter of William Cornthwaite and Elizabeth Townson. She was baptised at the mission at Robert Hall on 29 Jun 1763, apparently at the same time as John, her godparents being James Cornthwaite and Jane Townson. Perhaps they were twins but perhaps they were not even related!. Although no parents are given in this record there is little doubt at least about Jane's identity as all names and dates agree with other records. The Cornthwaite family tree has been traced through William back to Bryan Cornthwaite 1702-1772 and Agnes Bruce 1703-1783 and lastly to William Cornthwaite d. 1718 and Elizabeth Russell 1662-1726 Bishop Cornthwaite of Leeds also belongs to this family). She was probably baptised in the chapel at Hornby Hall. John and Jane were married at the Mason St Chapel on 17 Jan 1785, their witnesses being Robert Cornthwaite, Mary Ball and Agnes Cornthwaite. They had ten children all probably born in Lancaster and baptised in the Catholic chapel there, only the records for William and Robert not yet being located. Thomas Ball b. & chr. 27 Jul 1787, sps John Carter, Mary Cornthwaite, m. Elizabeth Salthouse 13 Aug 1810 at St Chad's, Poulton. It was usual to baptise babies as soon as possible, so most took place the same or the next day. Thomas was initially baptised by Elizabeth Cornthwaite 'in danger of death' and the rest of the ceremonies and prayers were supplied later by John Lindow, with only a 'conditional' baptism since a child could not be baptised properly twice. *Note - and corrections : there is no evidence for William's godparents being Peter and Margaret Walmsley or the date of 4 Sep 1791 for his baptism. A more plausible baptism is for a William Ball 'of Farleton' at Robert Hall & Hornby Missions on 27 Nov 1785, no parents given. Farleton is not far from Hornby. This book is only on my shelves - please ask if you wish to know what it contains. It does tell you quite a lot about them! In 1841 Thomas Ball, 4th child of this family, was listed as a tin-plate worker, living in Market Place, Poulton with his wife and four children, Betsy, Anthony, William and Margaret. Robert could perhaps be identified with the farmer at Holm Nook, Carleton, with wife Mary and children John 9, Eleanor 6 and Mary 3. Jane died on 12 Oct 1829. John afterwards married again, living with his 2nd wife Mary on Breck St in Poulton where he is recorded on the 1841 census. having left his son Richard to look after the farm, and died on 14 Jul 1847. John and Jane are buried together next to the old chapel of St John the Evangelist in Poulton which is now used as a parish centre. Their grave, marked by a flat gravestone is one of the oldest in the cemetery there. John's Will can be seen in full on the Wills page. The old chapel of St John's, Poulton - the grave of John and Jane Ball is in the far corner to the left under the trees. When we found it, it was quite buried under a good deal of rubbish, ivy, other plants and dead leaves and it took quite a while to clear it enough to read the inscription. 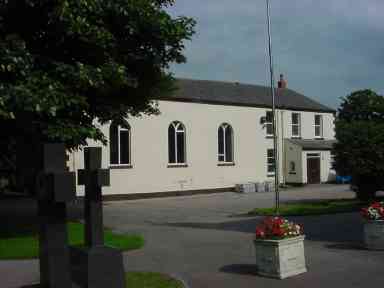 William and Margaret were married at St Chad's, the parish church in Poulton, on 15 Aug 1814. All their children, including also probably the last, Mary, were baptised at the then new Catholic chapel of St John the Evangelist in Poulton. John Ball b. 12 Oct 1815, baptised the same day and died soon after, bur. 31 Oct 1815 at St John's. Jane Ball chr 6 Jan 1828 at St Peter's, Lancaster, m. Thomas Brown, lived at Dolphin Lee. It appears that William and Margaret moved from Thornton to Heaton with Oxcliffe some time between 1816 and 1819. The first time they are recorded as 'of Heaton near Lancaster' is for the burial of their infant daughter Elizabeth on 18 Jan 1819. Their 8th child, William, was ordained at Ushaw in 1850 and died aged 54 in 1880 at Dolphin Lee, Bulk, Lancaster. His sister Jane was living there, now married to Thomas Brown. With thanks to cousins and others for vital information and invaluable related family trees. More on these sources on the contact page!